30 July 2016, it been a hot and humid summer so far. I needed some way to escape from the heat and humidity with my dog. I decided to go kayaking in Beaufort, NC. We started at the Boathouse in Beaufort and kayak toward the downtown. 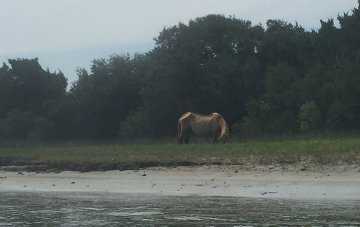 As soon we got to the other side of the creek, I spotted a horse on Carrot Islands. Ziva and I kayaked for 2 hours that Saturday morning, and logged 4 nautical miles. We stop even now and than to take in a dip.